What are the Top Professional Courses after B.Sc Computer Science? Just having a UG in Computer Science would not suffice in today’s competitive job market. On the other hand, you need to log into one or two short-term courses after BSc Computer Science. As computer science graduates after finishing B.Sc in Computer Science you will want to enter into the technical field. You may as well start preparing for the entrance examination to write entrance exams for post graduate courses in top colleges. Furthermore, you may even want to do M.Sc Computer Science. Or you may even search for job prospects. But whatever your decision may be, doing a short-term professional course will be greatly beneficial. 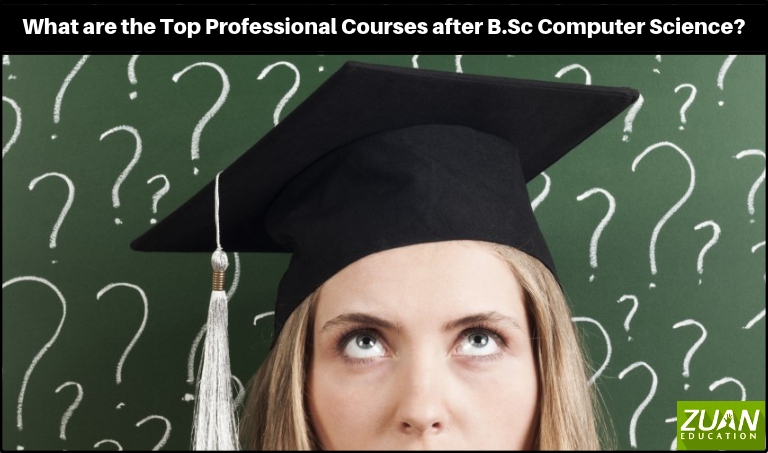 Therefore you need to know the list of courses after B.Sc Computer Science. And this article will guide you in that. Let us place the scenario. May be you are finding it difficult to get a job after your BSc Computer Science course. Or maybe one discipline of career fetches you more salary. And you want to master it. Moreover, your BSc course will not teach a specialization course in that field of your particular interest. In view of this scenario, you may be searching for institutions that offer such short term courses. And consequently the list of courses after BSc Computer Science. Therefore, let us do a small research on 10 courses. That will easily fetch you a job after your BSc Computer Science Degree course. In the application system analysis, you learn the administration, monitoring, and maintenance of software infrastructures and applications. This is one among the important courses after BSc Computer Science. Eventually, as an application analyst, you will oversee practices and processes to ensure integrity, safety, and availability of all data. And applications as part of organizations information systems. Furthermore, you’ll make sure that the processes needed for a business to function and succeed are running smoothly. Equally, you’ll act as a technical point of contact to fix application and systems issues. Equally, you will work within IT departments alongside application developers and software engineers. Database Administration course is one among the important courses after BSc Computer Science. You can do a series of Database Administration courses. Eventually, your job as a Database Administrator that will involve database administration, monitoring, maintenance, security, upgrading, configuration or installation. Furthermore, you will involve in the planning and development of the database. As well as troubleshooting any issues on behalf of the users. Furthermore, as a Games Developer, you will usually be concerned with either design (including art and animation) or programming. Equally, you will also learn to create and design a game’s look and how it plays. Similarly, animating characters and objects, creating audio, programming, localization, testing and producing. If you are a creative person equipped with the right skills you can land in a creative director job. Web Designing is one among the prominent short-term courses after BSc Computer Science. In web designing, you will learn the skill of producing and maintaining websites. Skills in web designing course are interface design, graphic design, web graphic design, user experience design. And SEO i.e. search engine optimization. Furthermore, the fees for this course are affordable. Markedly, the salary that you will draw after finishing this course is between Rs 3-9 lakhs per annum. This is one among the prominent courses after BSc Computer Science. This field can always be hailed as the most chief among other short-term courses after BSc Computer Science. Several premier institutions, especially in cities like Chennai offer specialized Digital Marketing courses. Furthermore, digital channels and social media are becoming the most essential of all modern marketing tools. Equally, all the functions in business involve digital platforms. That is why you need to have the basic knowledge & techniques which are being used commonly in digital marketing. Moreover, digital marketing course is one among the most economical and beneficial skills you can acquire these days. This is among other important courses after BSc Computer Science. Eventually, you get a job as a Systems Analyst. Furthermore, this job requires you to have a high level of technical expertise and clear insights into current business practices. Correspondingly, Search Engine Optimization (SEO) has got more attention in today’s competitive world. Furthermore, it is the latest technique to reach the website in top rank in search engines like Google, Bing, Yahoo, etc. So that, the site will be visible to the targeted customer. This kind of online marketing will increase the business’s revenue by generating leads. Significantly, you can get job opportunity as a SEO Specialist. Pay Per Click (PPC) is one of the main strategies used in Search Engine Marketing (SEM). PPC training is essential among courses after BSc Computer Science. Moreover, Pay Per Click works same across all platforms of search engines. Markedly, Google, Yahoo, Bing are three major players regarding PPC advertising. Furthermore, each of these search engines have got their platforms for PPC campaigns. It involves finding the right keyword to focus on in your website to show up in the search engine results. Significantly, you end getting a job as a PPC Specialist. UX Design Course provides you with the best practices of building a web design’s structure, elaborating its concepts. And authenticating its user experience in a prototype. This is one among the best courses after BSc Computer Science. Learn how to make websites using CMS and run your own blog or corporate website. Learn about how to build a website or blog in WordPress. During these web development training courses, you will learn how to install WordPress and configure it for SEO. Also, design a WordPress theme and develop an e-commerce website. And publish your images and posts with the open-source WordPress content management system. Furthermore, know how to make dynamic web applications using PHP in a complete web development training course. That includes complete PHP and MySQL fundamentals and more. At the end of the course you will become a Web Developer. You had a brush-up of some of the main courses you can do after have completed B.Sc Computer Science. There are also many other computer applications and software development computer science subjects you can learn. Complete BSc and also alongside develop your communication skills. Learning the above-mentioned courses is vital to fetch you lucrative jobs in the IT sector.